It is an exciting time for those that grow their own onions because onion season is in mid-flow. It was probably a while ago that the onions themselves were picked, but they generally grow through a short period of drying before they are used in the kitchen or put into storage over the wintertime. I love onions and they are one of the most loved vegetables, they are certainly the most used vegetable in the world – there is not a single cuisine I can think of that doesn’t use them. In Western cookery, onions make up one of the trinity of stock vegetables alongside carrots and celery; and there are countless recipes that begin with slicing or chopping an onion before browning in butter or oil. They are a universal seasoner of foods, a ubiquitous seasoning that is not always detectable, but if it were to be omitted you would miss them. And I do, for I recently found out that I have an onion ‘intolerance’, or at least my alimentary canal does. Finding a replacement has been tricky, but I have recently adopted using the finely sliced green parts of a leek along with a clove of garlic. It is strange that I essentially turn myself inside out after eating a cheese and onion sandwich and yet I can happily tuck into the remainder of the onion family: garlic, leeks and chives and not suffer even the mildest discomfort. Anyway, you don’t want to know about all that – I sound like an old woman! There are around 500 species of plant that belong to the Genus Allium, and botanically speaking they are all members of the lily family, though only a score are important as foods worldwide, and even fewer that are important to the British, though the onion, garlic and leek were all eaten in Ancient Egypt and even appear in the Old Testament of The Bible. 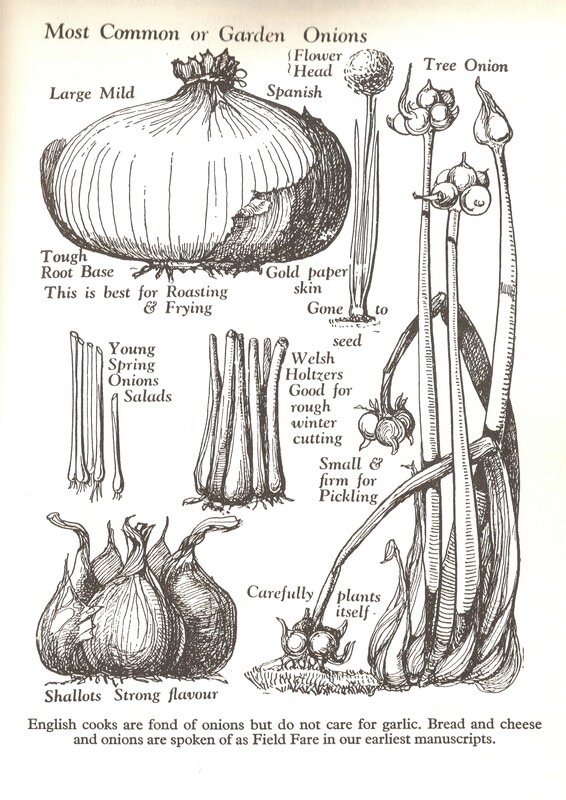 Below is a lovely illustration from the wonderful book Food in England by Dorothy Hartley showing the ‘Most Common or Garden Onions’. Chives and leeks have been omitted as they are suitably different to be considered standalone vegetables/herbs. There are familiar and unfamiliar onions here, and some that have been omitted, like mild white onions. Two that I have never sampled are the Welsh Holtzers and the strange Egyptian, or tree, onion. I am going to stick to the familiar brown onion that we all know and love in this post. At the foot of the above drawing it is mentioned that onions, bread and cheese ‘are spoken together as Field Fare in our earliest manuscripts’. These three food items would have been bagged up or kept in the pocket of a ploughman or other farm worker for much-needed sustenance throughout the long working day. The original ploughman’s lunch that dates to not too long after the first century when onions were first introduced to Britain by the Romans. So many recipes use onions, but so few of them show them off as the star of the show and we forget that onions can be served as vegetables in their own right. Here are two recipes that I think do them justice. This is a very old recipe that has recently been given a second wind by Fergus Henderson the great ‘nose to tail’ chef at St John in London. Looking at his recipe and one written in 1954 by Dorothy Hartley, there is only one difference and that is the type of onion used – a stoic brown onion or a prettier red onion. Use whichever you grow or prefer. Serve with roast game, chicken, goose or beef, using the appropriate stock. Smear some healthy knobs of butter on the bottom of a deep ovenproof dish. Peel your onions, cut off the rooty part and sit them in the dish. Pour in enough hot stock almost to cover. Season the tops with salt and pepper. Bake uncovered in a moderate oven, around 160⁰C, until the onions are tender within and caramelised without. Test their doneness with a skewer. If you only have a little stock, cover the dish and only remove it toward the end of the cooking time so they can ‘brown becomingly’. I imagined that onion marmalade had been around for ages but only seems to date back to the latter half of the last century. Who knew? This is a recipe of my own concoction and is a top-seller on my stall. There are plenty of dark sweet flavours as well as tart vinegar. I use cider or wine vinegar as well as Balsamic vinegar in mine. Feel free to alter the ratio of the two to your own liking. It makes about 1 litre (2 pints) of marmalade. 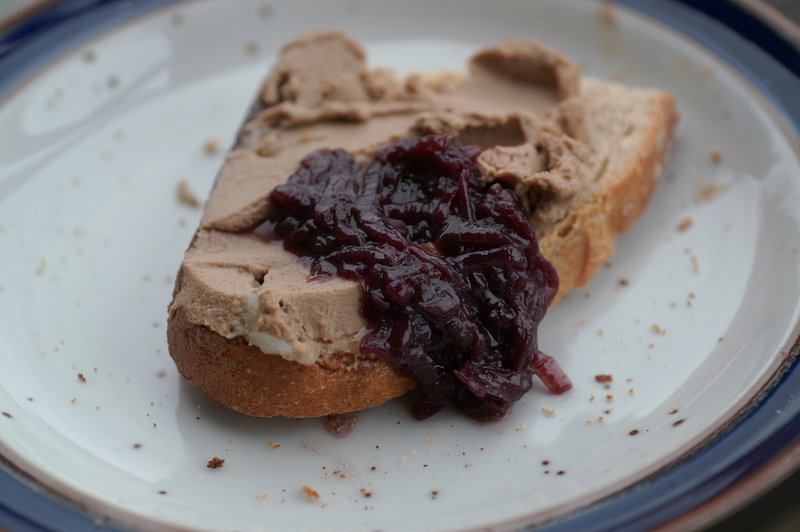 Have it in a cheese sandwich, with bangers and mash, or with some nice potted chicken livers. Heat the olive oil in a large pan. Turn up the heat and add the onion. Using a wooden spoon, coat the onions well in the oil. Add the sugars, thyme, salt and pepper, then turn heat down to medium and mix until the sugars have dissolve. Simmer uncovered for at least 50 minutes on a medium-low heat, until the onions have become deliciously brown and mushy. Take your time, be as slow as possible. If you don’t have 50 minutes or more to spare, wait for a time you do! Pour in the vinegars and simmer for a further 30 minutes until the liquids have reduced to about one-quarter and are good and syrupy. Let the marmalade cool for 10 minutes then jar as normal.